You knew this would start. I'd want to be the one to start it off. Yea. Murray's trial starts on the 14th of June. 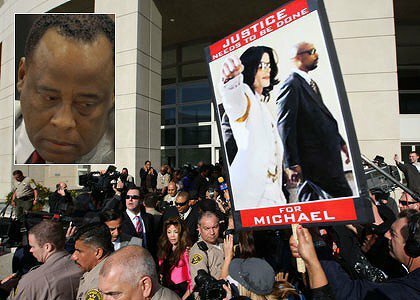 Dr. Conrad Murray's supporters are pissed off that only Michael Jackson fans are represented when the doc shows up in court ... and we've learned they're planning a big, big demonstration at next month's preliminary hearing. Sources close to Murray tell us a group of his friends, patients and fellow church members -- numbering in the "hundreds" -- will be outside the courthouse at Murray's next court hearing to show solidarity. We're told the group will rent buses in Houston and Las Vegas -- where Dr. Murray has his medical practices -- and drive them to L.A. for the June 14 court date. We're told the catalyst for the sojourn was that pesky banner that flew over the courthouse at the last court hearing, demanding justice for MJ. -- "Conrad Murray doesn't kill people. Propfol does." -- "Michael killed himself. Get over it." -- "Black or white, free Conny tonight!" -- "Conrad is no smooth criminal." -- "Everyone makes mistakes -- allegedly." The above link is the petition we created to ask for Justice against the greatest Injustice of all: THE MICHAEL JACKSON'S MURDER. We want to raise as many signatures as possible, more than 10,000, and forward it to LAPD and D.A. in order see the charges against Murray modified since we cannot accept an involuntary manslaughter when it's obvious is a real murder, according to the official autopsy's reports. We thank you in advance for your help and support ! Together, we can fight for the truth and see Murray and the possible other responsible for his death in jail. In fact, too many doubts and lies have been told so far and we need the TRUTH! <<On June 25th 2009, Michael Jackson died. His unexpected and untimely death has left millions of fans grieving. To this day, no explanation has been given, no justice has been done. The doctor who was at Michael Jackson's side the night he died is still practicing. Michael Jackson's death wasn't considered a homicide at first. The house he was living in was not immediately guarded by police and relevant evidence could have been easily manipulated,objects removed, thus affecting the investigation. There have been many people who have spoken to the press and have given different versions of the facts,none of which have been verified. This is distressful and confusing for all those who loved Michael. We ask the L.A.P.D. to release their own official statements keeping us informed on the development of the investigation for what is possible. We also ask for a thorough investigation conducted in a more timely manner in order to see those responsible for Michael's death punished by law. On behalf of all those who loved Michael and who continue to grieve his sudden loss, WE ASK FOR JUSTICE>>. Good, thank you. Are you familiar with TINI? I'd never heard of it. I'm checking out the website now. What a great campaign. Just be cautious. They do a lot of good things but these are "the fan girls", the followers. The group is closely in league with these women who went everywhere with Michael, as close as they could get. They sometimes get haughty and they sometimes fight with the other fans but they do mean well. One of them, Samantha, really started hanging around with Karen Faye, Michael's make-up artist, recently, and Karen Faye seems to be all out for the money. Samantha appears to be a lot about herself, these days. The one you want to pay close attention to, or the ones, I should say, are Taaj Malik & Geraldine Hughes. Taaj is a follower fan, too, but she's on the right track and she's out for justice. Geraldine Hughes was a secretary for the LA DA during the Chandler trial and she saw it all, from the inside. She exposed it for what it was and Sneddon for what he was. She wrote the book Redemption. Redemption proves that Michael Jackson was NEVER a child molester. Hughes worked for Evan Chandler's attorney in 1993 and witnessed the extortion scheme. If you or anyone else can get to this, and I am pretty sure you all can, it's good to have a look at this video. Oh, ho ho, Arnold Klein gave a campaign contribution on May 14th for the re-election of Steve Cooley - Murray's attorney. http://bit.ly/bHP0lC Nurse Convicted of Murder. lethal dose of Propofol, a fast acting anesthetic, . PLEASE CAMP/PROTEST DAILY ON ATTORNEY GENERAL PAGE, LET HIM KNOW HE WILL NOT BE ELECTED AS GOVERNOR OF CALIFORNIA, THIS IS CORRUPTION!! HE IS RESPONSIBLE FOR DA STEVE COOLEY, WHO HAS BROUGHT THESE BS CHARGES OF IMS!! Isn't a cut and dried case that it was an accident? Sir Knute wrote: Oh come on. Firist, Geraldine Hughes says she has proof Murray hooked MJ up to the propofol drip, then left to visit a call girl and didn't come back for 2 hours. So people are claiming that he intended to kill MJ? People are claiming he was hired with the intent to kill him, yes. Not everyone says that but a lot of people do and if you had been reading what is out there to find, you'd know why. Were you aware of the conflict of interest with John Branca being rehired, just about a week before MJ's death, yet Michael FIRED him in 2003? And the reason he fired him was because Branca and Motolla were embezzling his money into an offshore account and now Branca is suddenly his attorney and suddenly one of the administrators of his estate? There's a going to be a trial. That is the only fair way of delivering justice. Comparing number of signatures on rival petitions and deciding whether or not he's guilty based on that isn't the right way to go about it at all. Elessar wrote: There's a going to be a trial. That is the only fair way of delivering justice. Comparing number of signatures on rival petitions and deciding whether or not he's guilty based on that isn't the right way to go about it at all. And that's only one tiny part of this and I think you know that. One tiny part of what? The trial is the ONLY part that matters. It doesn't matter what supporters of Michael Jackson or supporters or Conrad Murray do; it doesn't matter what unsolicited detective work people do on the internet; what various proof for various things people claim to have; or what certain books say about certain things. All that matters is the evidence given in court, and the verdict the jury reach. That's literally all that matters, and that's absolutely the way it should be.